In this post we’ll be seeing our review of the Fieldline Alpha OPS Daypack. When it comes to selecting a bag, you need to know where you intend to use it. If you happen to be a traveler or if you like outdoors, you definitely need to have a backpack that comes with features and specs that you do not regularly find in the usual bags. It needs to be a bag where you can safely put your gears and other stuff that you need while you are traveling. And in finding one, there are lots of brands to choose from and among these is the bag made by Fieldline. The Bag Itself Is Designed For Outdoor Use. It Is Very Stylish, Durable And Well-made. The Stitching Is Also Good. Unlike Other Bags That Can Be Too Heavy And Bulky To Carry, This Bag Is Comfortable To Carry And Wear. The Main Compartment Of The Bag Is Spacious And It Comes With Zippered Mesh Pockets For Easier Identification. The Secondary Compartment Has Enough Space For Your Gear. You Can Find Hydration Bladder Outlet Both On The Left And Right. The Padded Handle Is Heavy Duty So You Can Be Sure That This Bag Is Truly Built To Last. You May Experience Getting Sweaty Even If There Is Cushioning And Mesh. The Fieldline Alpha OPS Daypack is a multi-purpose bag that comes with a huge main compartment, giving you a lot of space and storage options. For outdoor enthusiast and those who are always on the go, carrying a bag that where you can safely place your items and other belongings is a must. Anything that you need to put in your bag can be safely stored in this daypack as it comes with a pouch for your digital media and with an integrated port for your headphone. What makes this bag different from the others? At first glance, it looks like a simple bag pack. It is stylish but it is created even for heavy duty use. Let’s have a close look at its design and features. The brand is known for its workmanship and this bag never fails to deliver. There are so many things to love about the Fieldline Alpa OPS Daypack as it comes with different features that you can only find in a multi-purpose bag. You can use both of these internal and external features to make it easy for you to store and organize your things. It comes with a specific pocket at the top front where you can put your accessories. It has a zipper closure so all of your small items are in place. The secondary compartment is also roomy where you can put your other items as it comes with a gear organizer. To balance the gear, it comes with side compression straps. The brand offers lifetime warranty coverage. This ensures you against any defects in the materials or workmanship. The bag is created by one of the most established brands in the industry. Fieldline started way back in 1973, Altshule brothers built a business that came out of their passion for the outdoors and the demand for using outdoor gear. 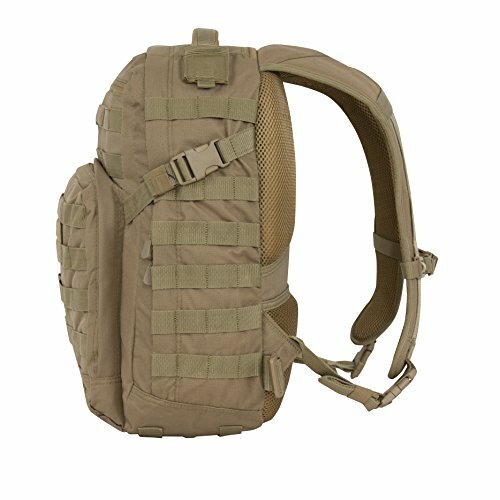 They were able to make a durable and high quality hunting pack and other accessories. As the brand continues to grow, they have successfully launched different products and one of these is the Fieldline Alpha OPS Daypack. Just by looking at the design itself, the Fieldline Alpha OPS Daypack is a very stylish bag that you can carry anywhere. But it goes beyond just a stylish design as this bag has various amazing features that you can use whenever you are on the go. It gives you flexibility when it comes to organizing your outdoor gear, device and other personal items. The main compartment is has a lot of space and it gives you various storage options where you can place your devices, gears and other stuff which makes things easier for you especially when you need to use them and you have to pull them out of your bag. With everything that this product has to offer, this bag is definitely worth the purchase.